Posted October 5, 2014 by Heather Michet & filed under Food, Recipes. Zucchini bread isn’t the only sweet treat you can create with this summer squash. Whip up these brownies and enjoy your chocolate and vegetables at the same time! 2 cups flour, any variety. Oat flour is good and is gluten-free when using gf oats. Blend flour, sugar, salt, cocoa and soda in bowl. In a large, separate bowl, combine remaining ingredients then fold dry ingredients into wet, just until blended. Spread batter in lightly greased 9×13″ pan. Bake 30 minutes in preheated 350 degree oven. 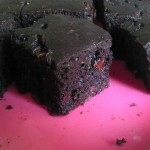 To really get your zucchini on, serve these brownies for dessert after a meal of Zucchini Feta Pancakes and side dishes.